Adam Hall is my favourite writer. In my view, he is one of the true great spy novelists, and his work deserves as much attention as John le Carré, Len Deighton and Ian Fleming. His protagonist was a British secret agent known only as Quiller, who works for an officially non-existent agency called The Bureau. Hall’s 19 Quiller novels and one short story, published between 1965 and 1996, were a major influence on my conception of Paul Dark. If you like my books, I’m pretty sure you would enjoy the Quiller series. They are gripping, intense and complex spy thrillers, written in a virtuoso style that at times takes the breath away. 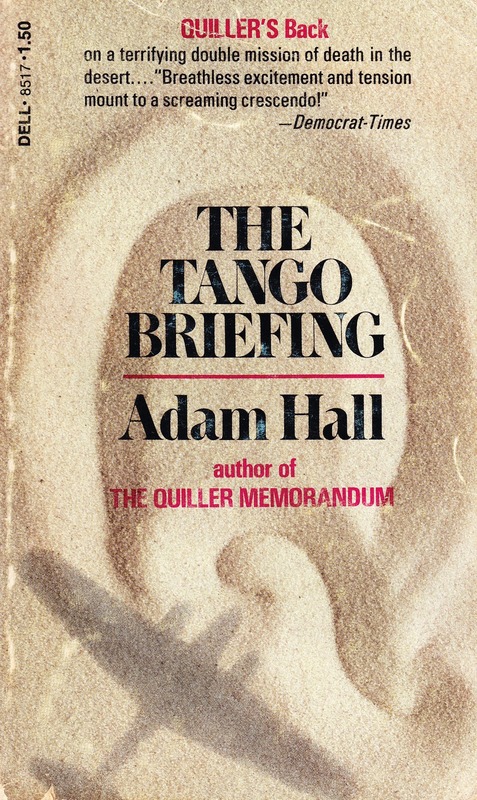 THE TANGO BRIEFING and THE NINTH DIRECTIVE are probably my two favourite spy novels. Despite praise like this, Adam Hall has never achieved the fame of some other spy novelists – but he has come close. 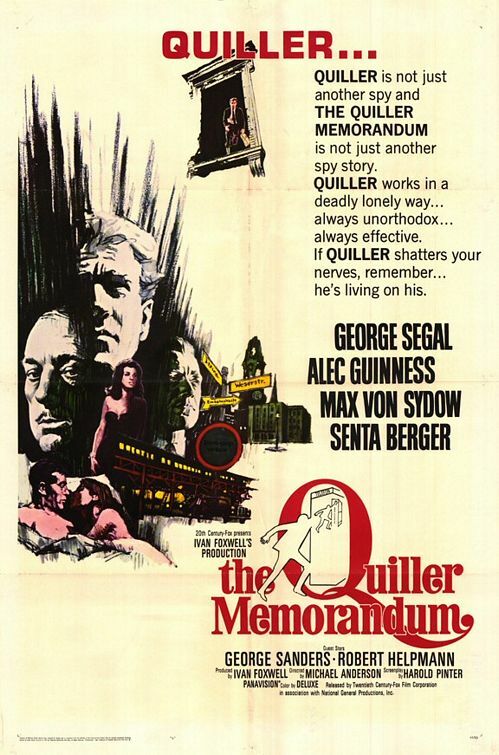 The first novel in the series, THE BERLIN MEMORANDUM, was retitled THE QUILLER MEMORANDUM in the US and won the Edgar for Best Novel of 1966, beating Len Deighton’s FUNERAL IN BERLIN among others on the shortlist. It was filmed as THE QUILLER MEMORANDUM the same year: shot on location in Berlin, it featured a score by John Barry, a screenplay by Harold Pinter, and starred George Segal, Senta Berger, Alec Guinness and Max Von Sydow. It’s a good film, but it wasn’t quite as great as the adaptations of Len Deighton’s THE IPCRESS FILE, with Michael Caine as Harry Palmer, or John le Carré’s THE SPY WHO CAME IN FROM THE COLD, which starred Richard Burton as Alec Leamas. But the novel is certainly on a par with both those books. In 1975 the BBC made a TV series, with Michael Jayston starring as Quiller. I’ve never seen it (and it seems the original tapes may have been scrubbed), but it was not the success Hall had hoped for. According to an interview he gave with The Guardian in 1985, sales of the novels declined after they were reissued with ‘As Seen On TV’ on the jackets. But perhaps it’s time, in 2010, for a Quiller revival. I’m delighted and honoured today to present a Q&A session with Adam Hall’s son. JP Trevor is an acclaimed designer/artist, having created Special FX art for STAR WARS, set designs for BATMAN (a 100-foot painting of Gotham City at night), as well as award-winning TV spots, a major rock concert for Russia’s leading star, next to the Kremlin, and much more besides. You can check out some of his work at his website: http://www.thinkshapes.com/ JP also wrote Final Chapter, the moving essay at the end of QUILLER BALALAIKA describing how his father completed that novel shortly before his death. You can read that on the excellent resource Quiller.net: http://www.quiller.net/trevor/jptribute.html And he designed some of the Quiller artwork, notably the figure of the trench-coated silhouette, and took several photographs of his father that were used as jacket portraits. He took the one at the top of this page, for instance, at an airport in Oregon, after persuading a commercial flight to wait so he could use its stripes to provide the background. Jeremy Duns: Hi, JP, and thanks very much for agreeing to do this. Let me start by asking you about the film world, and the current situation with the Quiller series. Who holds the rights, and is there anything in the works? 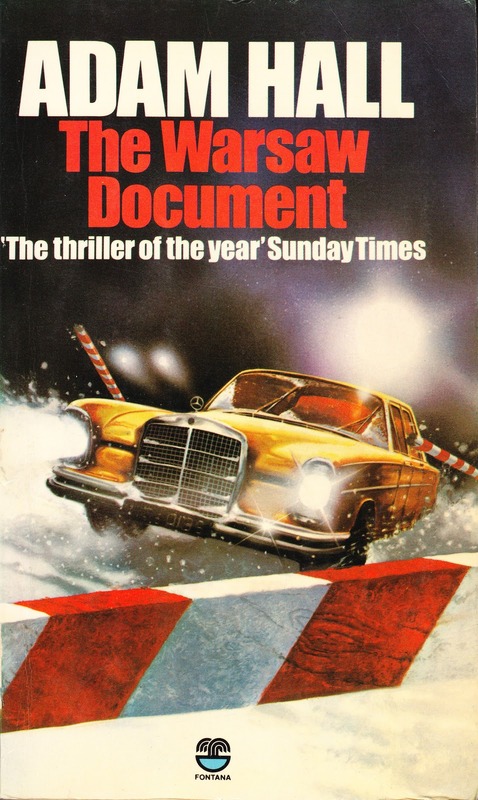 I seem to remember reading years ago that MGM had optioned all the novels with the exception of THE BERLIN MEMORANDUM, and had the idea of filming them in every year alternate to a Bond film as a sort of tougher, more realistic alternative to that series. Is that right? JP Trevor: United Artists/MGM bought the movie rights to QUILLER SOLITAIRE some years ago. Prior to that I was invited to meet the heads of United Artists after they’d read my Final Chapter piece to discuss Q, and they asked me my thoughts on casting, et cetera. Jeff Kleeman was one of the executives at that meeting. After the horrific 9/11, I spoke with my contacts in LA and they told me the public would probably not want to see films with lots of explosions. And that Q was a good bet as it’s lower key and different from Bond, although I can’t figure out why my father put in explosions here and there. Time went by and they ‘revamped’ 007 and nothing happened with Q. Now, MGM is close to being bankrupt and I’m not sure what’s happening with Bond. I’ve no idea why THE BERLIN MEMORANDUM was not included in the MGM contract. I do know that it was one of UA’s heads’ brothers that made THE QUILLER MEMORANDUM. My contact in LA, myself (and you) favour filming THE TANGO BRIEFING. My own thoughts on this: Bond is a franchise (like Wrigley’s chewing gum) so it has ‘history’ and film momentum (Q does not) and it would probably take a few flops to send 007 into space never to return. (Ironically one of my art collector friends is Lewis Gilbert, who did send 007 into space in MOONRAKER). So for me, 007 is on shaky ground – though nobody else might agree with me. I also hear that the Bond people are a bit nervous about Bourne... I had a private meeting with Pierce Brosnan in London two years ago and I told him he was better than Craig. I had proposed to Mr Brosnan to play Q. I could go to MGM with a star...bla bla. Anyway he called me a week later; he passed on Q as he had his own project that might conflict, he told me. But if Bond goes down la toilette, Quiller would be a good replacement because it’s also a franchise (18 books, excluding MEMORANDUM). And it would cost less. But I’m not sure Hollywood could make the first Q a hit. And if the first film bombed, that’s the end of the franchise – in their hands – and they have signed in perpetuity; a Hollywood habit, so nobody else can touch it, but I have ideas, hinted at in my piece Life Like Quiller. Hollywood is not much better with sequels anyway. 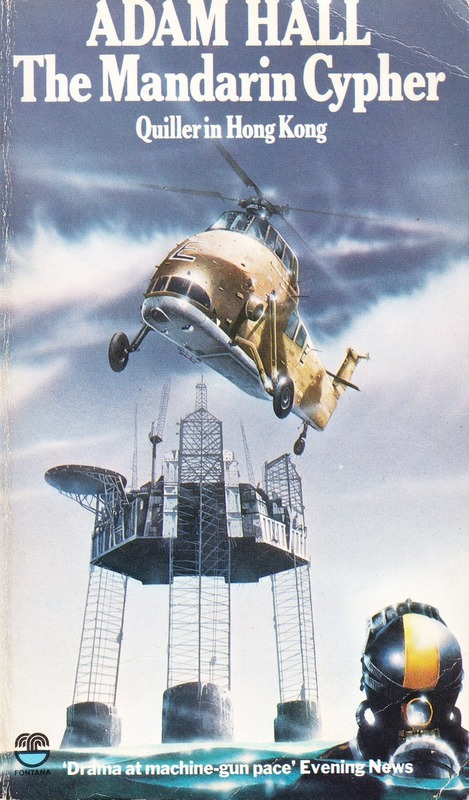 (The recent remake of my father’s novel THE FLIGHT OF THE PHOENIX, for example). The thing is: Bourne (wow, what a coincidence...) is a bit too ‘Quillerised’ and so is the latest 007 movie – and I know why, but I can’t say anything for now: you’re right about reading that they wanted a tougher, more realistic agent. Then guess what happened; 007 (with Craig) became just that – or a poor example. So, the niche that Quiller fitted into is now smaller, as Bourne and Bond (the only real rivals) are looking too much like Q. 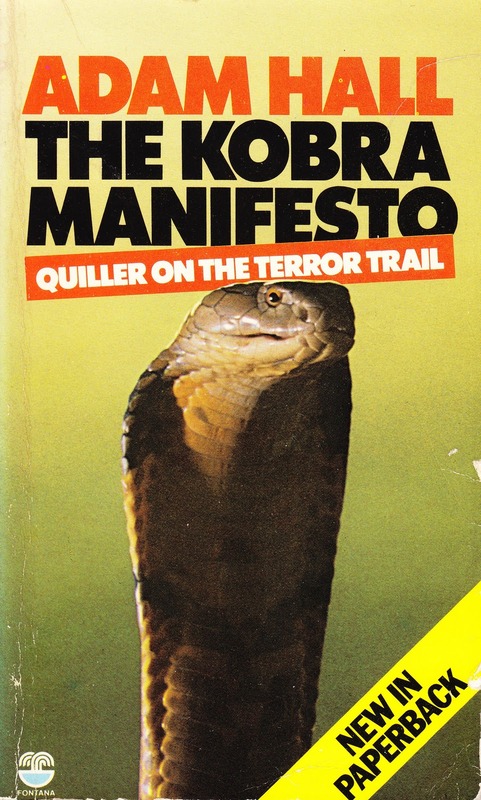 The solution, in my humble opinion, is to revamp the Quiller format – I have the original Q Format – then make a book like THE TANGO BRIEFING in Europe. It could be done for a fraction of a 007 budget. Conclusion: for now MGM and Quiller is up in the air. Whoever buys MGM might, or might not, appreciate Quiller. JD: Thanks. All of that is fascinating, and answers a lot of things I’ve been wondering about over the years. I see your point that the new direction of the Bond films and the reimagining of Robert Ludlum’s Jason Bourne in the Matt Damon films might have spoiled the turf for Quiller a little in the eyes of some film industry people. But perhaps there’s another way of looking at that. As you know, the best-selling American thriller-writer Eric Van Lustbader, author of THE NINJA, is a huge fan of Quiller and says so on the jackets of many of the paperbacks: ‘When it comes to espionage fiction, Adam Hall has no peer’. I take it you know that he also now writes the Jason Bourne novels, to great success, and that in 2007 he dedicated THE BOURNE BETRAYAL to the memory of your father and featured a hat-tip to Quiller’s famous request to send roses to Moira within the book. A couple of months ago I was at the Harrogate Crime Festival in the UK and bumped into a writer called Jason Elliot, who had just published an acclaimed spy novel called THE NETWORK, which is set in Afghanistan. We were delighted to meet each other, and found we had a lot in common – including a love of the Quiller novels. He was there with his publicist, and over drinks we rhapsodized about the strengths of the books and why they should be better known until, I’m sure, she thought we were both quite mad. My point is that surely today we need Quiller more than ever – and with Bond, Bourne, Bauer and others, there is clearly an appetite for intelligent, intense, complex and taut spy thrillers featuring an agent who knows how to reach the objective. I’m intrigued that you mention cheap European location shooting. I’ll keep my fingers crossed. Moving on a little, I mentioned that Quiller is intense and complex, and having read some of your own thoughts about your father I take it he was, as well (and you, too, if you don’t mind my saying). Do you think that’s a fair assessment? What do you think are the strengths of the novels, and what are your favourite aspects of them, and of your father’s work in general? JPT: I didn’t know about Van Lustbader and Q. Small world. Thanks also for saying that we need Q more than ever. I would like this series to survive and even get a new lease of life. As for making a movie over here, that’s quite a challenge, but who knows. Yes, my father was a very complex guy. Me too. Being a designer/artist doesn’t make it easier. The main strengths of his Q novels for me are that he’s not afraid to cut/edit (unlike le Carré) and he doesn’t get frivolous. He sometimes doesn’t even bother with commas or full stops, a style I like. Stream-of-consciousness type thing. Most of his Quiller stories are hard to put down, a good sign. He does not over-describe, which I also like. He had a strong visual way of writing, which is maybe why his books are easy to film. I’ll never know if my father was a spy. When a British paper interviewed him in Arizona and asked if he had been a spy, my father said ‘Let’s talk about the weather’. I sort of doubt it, and that he answered that way as a tease only. But he did seem to encounter real spies and CIA types here and there. JD: Bauer is Jack Bauer, an American agent played by Kiefer Sutherland in the TV series 24. I think the current incarnation of Bond, as well as Bourne and Bauer, have something of the darkness and grit of the Quiller series, although I think Quiller is darker and grittier than all of them. That’s a very interesting point about anger and warmth. And I also wonder if he wasn’t involved in some peripheral way in the espionage business, perhaps during the war. I also agree that Quiller should be much better known and given a new lease of life. 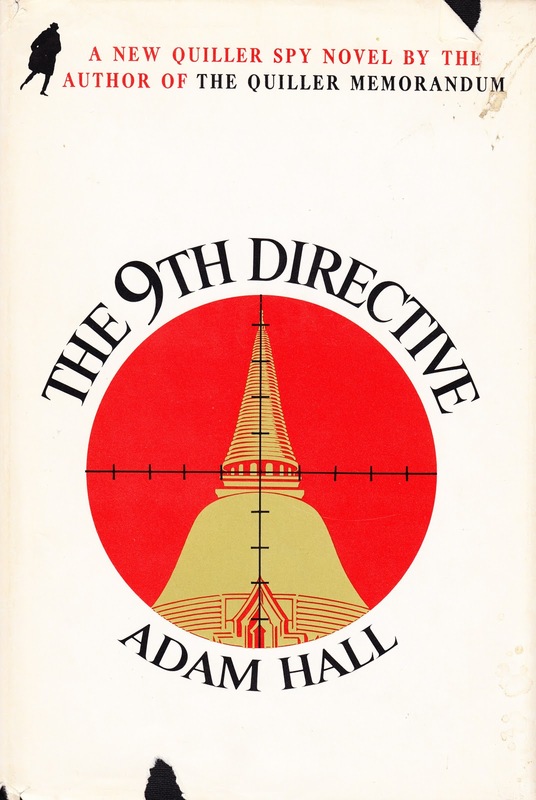 Ostara Press recently republished THE NINTH DIRECTIVE as a Print on Demand book as part of its new Top Notch Thrillers series: http://www.ostarapublishing.co.uk/book.html?id=50 How did that come about, and are there plans for any more re-releases? How about ebook editions? I have multiple editions of the books, but would love to be able to carry them all around with me in my jacket pocket. And Kindles can be very valuable weapons if you’re approached suddenly in a dark alley. JPT: Thanks for the info on Jack Bauer. Funny that both names start with a B like Bond. Yes I agree, Q is grittier than most. I think my father had a lot of emotional scars from the war (the Germans killed his brother) and he hated headmasters so the grittiness, I think, came from his anger. I’m not sure about his being in the spy biz, but if not, I’m sure it must have been tempting at times. I will never know. My mother was in Naval Intelligence in Britain. My father was an RAF Spitfire mechanic. Ostara is releasing THE STRIKER PORTFOLIO soon, I believe. Mike Ripley (who is heading the Top Notch Thriller line) has proposed working out a Kindle deal with me, but my stepmother’s agent in NYC (Spectrum) has made that difficult to proceed with. But I will watch for other e-book opportunities. JD: Excellent. Okay, one more question and then we’ll signal London. Your father’s papers are housed at Arizona State University. He was enormously prolific, and left us with not only the 19 Quiller novels but a host of others to enjoy. But I have a soft spot for Quiller. He was also a prolific researcher and note-taker – a compulsive worker, I would imagine. So I suppose I’m wondering if there is any unpublished Quiller material in his papers that could be published in the future, or is that it for the literary Quiller? JPT: I think he wrote with a compulsion to survive his inner world, which was pretty dark. Like you, Q is my favorite. As a kid, like many, I wanted to be 007. ‘Living like’ Q was a good second best. The unpublished material I have with me is some original PR material for the Q books, the original QUILLER BALALAIKA plot book of his, and the Q Format – why Q is Q. I’m happy to share the Q Format with you sometime. The Bureau is open for signals whenever you wish. Except I hear it does not officially exist. JD: I might just get back to you on that Q Format! Thank you so much for taking the time to do this – and all the best for the future with Quiller.